1 in 3 deaths. 1 in 3, dear friends. ﻿“GO RED LIKE WE MEAN IT”! Hey, Gypsy Souls, this is for you! Grab bags filled with three, four or five pieces of vintage costume jewelry for only $10 including shipping. Each bag is a unique mixture of cool & funky bracelets, rings, necklaces and pins. A surprise you deserve, I’m sure, or the perfect Valentine’s Day gift for a daughter at college, your mother, best friend, co-worker, sister, or any other lady in your life! Come on and let your Gypsy Soul shine! No broken jewelry, onesie earrings, or missing parts. Click link below to shop So Many Somedays @ Etsy. Success! Now check your email to confirm your subscription and you’ll be all set. 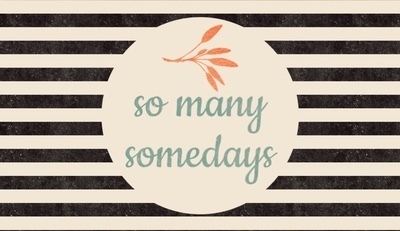 My name is Laurie and I am so excited to see you have found my blog, “So Many Somedays”. I hope you enjoy visiting often and find that my stories relate to your life. I should warn you that I am ADHD, INFP -A/-T. This might not mean anything to you yet, but just follow my blog and you’ll begin to see what this crazy combination leads a person to do. I am certainly not normal, but my guess is that you feel the same way about yourself if you have found your way here. Quite possibly, we have some fun things in common and will end up inspiring each other to be our best, perfectly, imperfect self! I am honest, a good friend and confidant, kind (unless you do something I can’t tolerate, (see below for “Things I cannot tolerate at all and will not be “kind” about),” 5′ short, very busy minded, maybe even a little scattered at times, deaf in my right ear, married to a CPA, daughter is a CPA & son is a Dental student (bless their hearts for loving me). I am self conscious, but confident, an imperfect perfectionist and an extroverted introvert. I have BA in Bus Adm (too ADHD to commit to a speciality, lol). My “real” career is working as a Payroll Specialist at a local community college. So yeah, a lot of my blog addresses “creative” vs. “analytical” mindedness. I don’t always finish creative projects that I start. Okay, I don’t finish most of them and I collect a lot of pieces and parts for these projects that never come to fruition. When I do finish a project, it usually turns out pretty cool! I ALWAYS finish payroll on time, except once in 10 years. We’ll talk about that later too. I usually spend way too much time on Pinterest getting ready to start a project, but I will sometimes start a project on a whim. Are you getting a picture of my busy, conflicted mind yet? My hobbies are painting. I am a “Spontaneous Creator” that will paint anything, using anything close at hand as a paint palette. Making decals, wood signs and stencils using my Cricut. Doing “fixer upper” house projects and anything “Magnolia”. We stayed at Magnolia House in McGregor, TX the first Spring it was available to rent. Stay tuned to my blog for more details on that and my second visit to Waco to stay at Hillcrest Manor in Fall 2017. I have tried a lot of creative business attempts over the past 20 years. My sister and I have said “we could make a million dollars on this” more times than I can count. It’s a joke between us now, but it wasn’t in the beginning. lol. Mop dolls, plastic flag pins, stuffed bunnies, doily angels. I could go on and on. Just because we didn’t make a million dollars, doesn’t mean we didn’t make SOME money (we might have made enough to cover our supplies). One mil would have been the icing on the cake, (oh yeah, we shared a lot of cake) but I wouldn’t give up the memories and laughs together for any amount of money. Reminder to self: blog about “Shake it Off” someday if sister will give me permission. lol. Also, I use “lol” way too much! If you can relate or are just curious to see what happens here next, please subscribe below for updates. I’m so excited to meet you and hear your “So Many Somedays” stories!